Just found your site and wanted to tell you how interesting it is, I can see me spending a lot of time browsing on here. During my time at Bevercotes I joined the Colliery Rescue Team and trained at Mansfield on Aerolox and Proto IV and I can say browsing your site brought both memories of a proud industry and a lump in my throat. 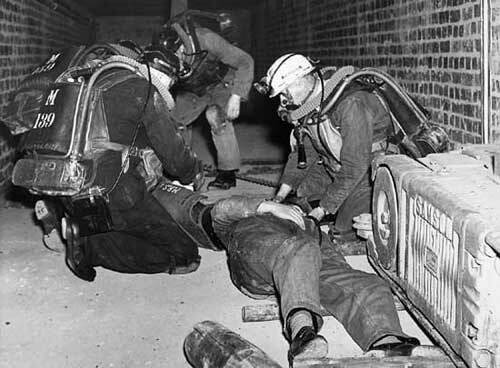 I remember the training galleries under the Station and the practices we carried out in the smoke filled tunnels. The highlight probably was the annual competitions at Area HQ Edwinstowe where we always did fairly well although the prizes of towels and clocks lacked imagination. I still have my colliery checks somewhere and use the numbers for the lottery, never won anything yet mind. Anyway rambling on so will leave it there but a great site. I am presently tracing my family history, I am emailing for myself but also for another Calladine who is also tracing their line of the family. I have to say you website is excellent and something to be proud of. From my earliest ggggg greatgrand father the male members have all been miners at sometime in and around Heanor and Nottingham. I was thrilled to see the Les Calladine diaries, however I have no idea if he is connected in anyway. My other Calladine historian informed me that he believed one of his relatives was the Calladine who, whilst mining, created a small hole with his pick in a Nottinghamshire mine, and found out that the River Trent lay behind it causing a small leak. This was sealed with concrete and was known as Calladines Hole. He mentions a cartoon in the 1970's, during the miners strike, of this ugly flat concrete wall, with an inscription written by a finger saying "Calladine's hole lies behind this plug"
It would be fantastic if we could trace this myth and give it some substance, and wondered during your research if you had come across such a story. I will check out the other websites you have given, many thanks for the information you have written. Just a short note to Gary Calladine - That an Albert Calladine was killed in the Bentley [ Doncaster] Explosion of firedamp caused by gobfire or safety lamp. 45 were killed. He was one of the last to die - my maternal Grandmother was Ethel Calladine - therefore Albert was my great uncle. The name seems to centre around Ilkeston area so I assume they moved from there to Doncaster.